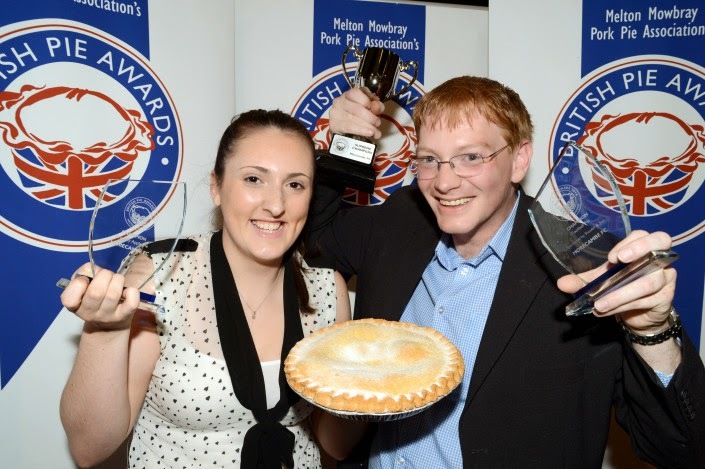 continue reading "Countdown to the British Pie Awards 2015"
Considering the amazing range of unusual and exotic pies Nice Pie have made over the short time they've been in existence - summarised in the list of Nice Pies we've rated - it should come as no surprise they've always got another quirky offering up their sleeve! So after their TV appearance on Jamie and Jimmy's Friday Night Feast on Channel 4 recently, where they focused on their Wild Squirrel pie (which we went nuts for when we rated it back in January 2014), we couldn’t resist trying their interestingly named "Roadkill Pie" this British Pie Week, alongside a steak pie on Day Three! And while the name might put some people off, it makes total sense to me and I was certainly game to try it! After all, it certainly solves the problem of deciding which game meat to have in a pie when this option contains pheasant, rabbit, venison AND partridge! As part of our “How long can we just eat pie for?” Pieathon challenge we thought we’d benefit from a range of their smaller pies, which coming in at £3.50 is pretty reasonable for a hefty, meat filled pie packed with delicious filling and cooked in their lovely butter shortcrust pastry. As I’ve mentioned before many a time with these Nice Pies (for which you can see a full list of all the previous Nice Pies we've rated here), it is amazing how they hold together so well despite being so filled with content. The nature of the pastry means it can be a little crumbly in places but in general it is very nice and lovely and golden once cooked, which you can see in the lovely photos! The Roadkill Pie was possibly the most mixed-meat-filled pie we've had since the infamous "Polabe" pie of 2011, which was a combination of Po(rk)La(mb)Be(ef) and didn't really work so well as a mix of flavours. Fortunately, going for a much simpler name and a more logical game meat mix, the Roadkill pie flavour worked a lot better. As is a feature in all the Nice Pie range, the pie was once again full of succulent and tender meat. I still can't get over the fact that the meat content in these pies is 70%, when so many supermarket pies are down in the 20-30% range, making it one of the most meat-filled game pies we’ve had. And it was the return of partridge in a pie following the unique "Partridge in a Pear Pie" I had at Christmas! With a great capacity, one thing I did feel the pie lacked a bit was a more substantial gravy or sauce. For sure the meat was lovely and moist - and you can see in the photo there were remnants of liquid stock - but I would have preferred something slightly more. (I was perhaps pining the near perfect consistency of the gravy in the Red Stag pie I had the day before!) That said, you wouldn't want to overpower the different flavours of the meat in doing so, in which case it may be best left as it is! As with any mix of meats, you do have to try and balance the flavours in the pie, which can be harder than when you are just producing a single-meat pie, but I thought they worked well together and once again the pastry was crisp and golden, holding together well in spite of all the meat weighing this pie down! The pastry was in general very good, with a clever crisp "tyre-track" complexion and a softer but tasty side and base pastry. Eaten just the day after the Red Stag pie, it didn't quite live up to those lofty expectations but really wasn't far off! There's no doubt I'd be game for another! We celebrated British Pie Week 2015 with some Nice Pies! The Peppercorn and Brandy Steak Pie was again noted for its very good filling:pastry ratio. The meat was so lovely and tender – a real delight. Once again packed in at 70%, there was no missing the meatilicous content of this pie! Having eaten the Cow Pie in their range the day before, which was noted as being quite peppery in itself, I was more prepared for the peppercorns this time round and it certainly delivered! The pepper and brandy flavouring is a novel addition and if you enjoy your steak pie well seasoned this is probably the pie for you! 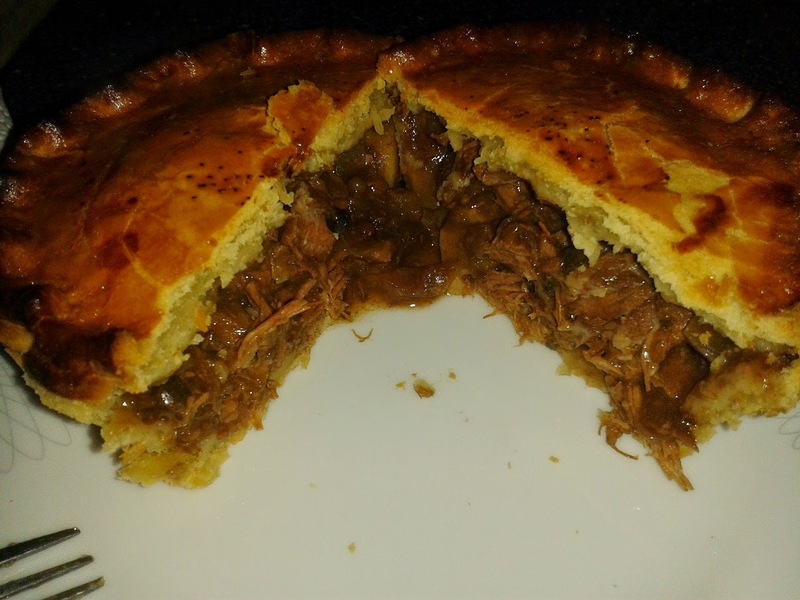 Being very similar in content to the Cow Pie I'd had the day before it was very difficult to make a massive separation between them, other than to suggest if you prefer a more seasoned pie then it would be worth investing in the Peppercorn and Brandy Steak Pie option! If you don't, the Cow Pie is just as great! Once again it's another Pierate Recommended pie from Nice Pie! Once again Nice Pie have done us proud, producing more Pierate Recommended pies and while it’s hard to resist the amazing range of exotic pies Nice Pie do, you would certainly be missing out if you didn’t tuck into a more traditional pie flavour from their range when given the chance! continue reading "Have Nice Pie made a (road) killer pie?!" 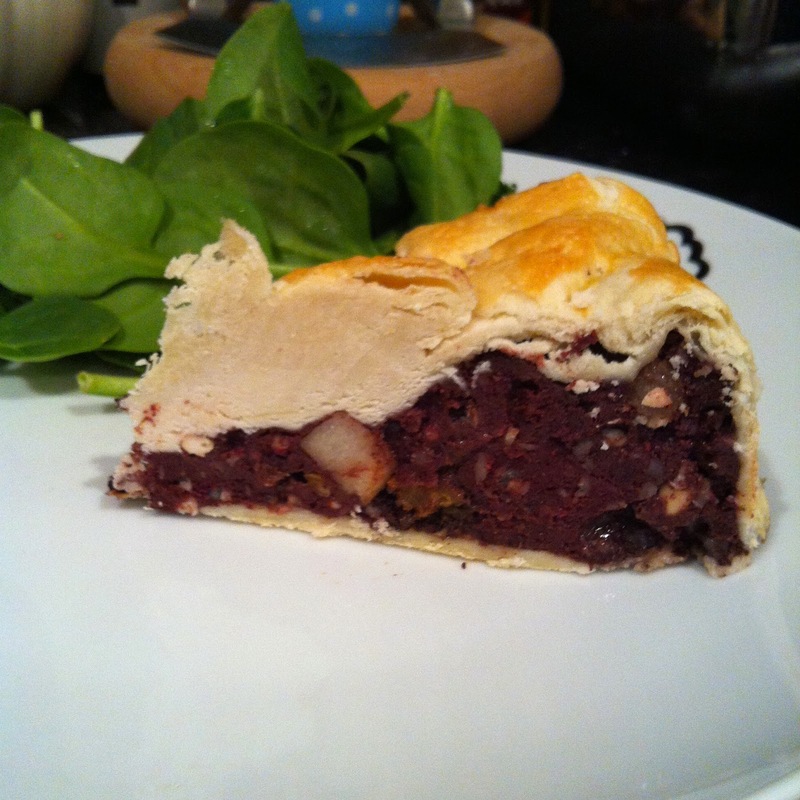 continue reading "Reci-Pie Review: Waitrose Black Pudding Pie"
Of course with almost 500 pies rated on Pierate we're no stranger to using any old excuse to eat and rate pie, especially with it having just recently been British Pie Week from Monday 2nd March 2015! And we're delighted to announce that between two Pierateers (RAS and SJL) we managed to smash the previous best of 55 pies consumed by eating 71 pies between us! Hundreds of you read our Countdown to British Pie Week article to find out more about the week and check our special countdown timer - giving you the precise days, minutes and even seconds til British Pie Week 2015! We also once again encouraged you all to make a #PiePledge to get involved in British Pie Week this year. And naturally we made a few crazy #PiePledge commitments ourselves too! These included our 50-50 pie challenge, with the aim of at least 50% of Rob's diet being pies (see how he did here), and a #Pieathon to see how long we could last on just pies alone during the week! The Ship's Cook also got involved, creating possibly the world's first ever Four Course Dinner Pie! And if you'd be willing to give to charity Action Against Hunger, in support of our crazy pie commitments, you can still do so on our justgiving page. 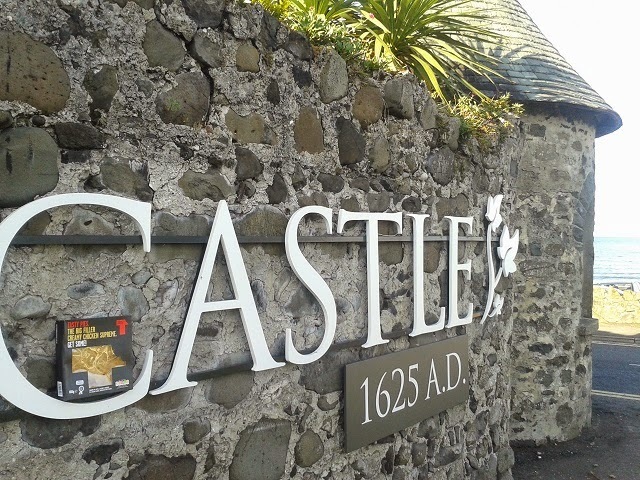 continue reading "Pi Day Special - 71 Pies for British Pie Week 2015"
Ballygally Castle - with a Tasty Pie! If there’s one thing that’s been missing from the almost 500 pies we’ve rated on Pierate, which has been bugging me for a while, it’s our lack of pies from Northern Ireland! Sure, we’ve had hundreds of pies from England and sampled a number of pies in Scotland and Wales too, but Northern Ireland has been missing from our UK pie-dentity parade for a while! 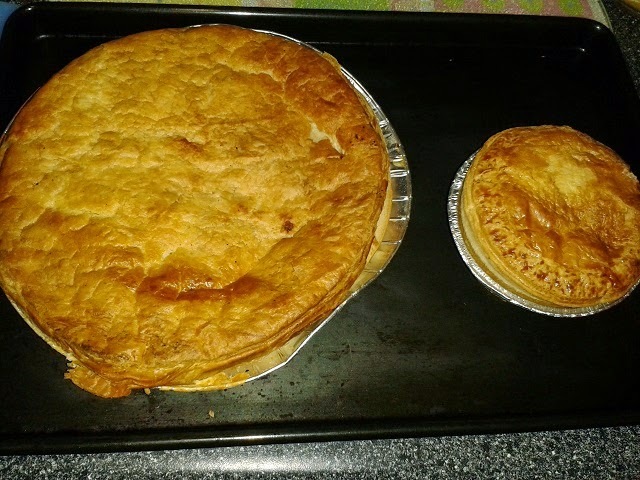 So when Pierateer RAS got the oppietunity to head over to Northern Ireland for a wedding it seemed rude not to pick up a pie or two when going past a large supermarket chain. 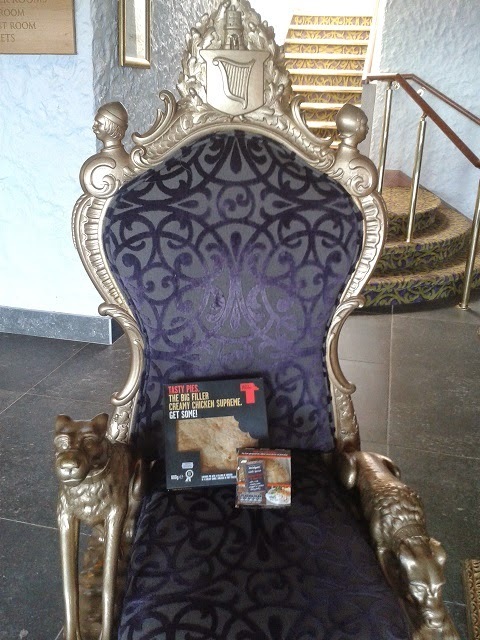 Pies fit for a king? The pies he got his hands on were the Tasty Pies “Big Filler Creamy Chicken Supreme” and the McColgan’s “Chef’s Special Chicken Breast and Ham Pie”. Both would turn out to be a credit to their nation, however upon further research it appears that, while the Tasty Pie I bought was made and sold in Northern Ireland, you are also able to obtain these in other parts of the British Isles. Bonus! While the stunning Ballygally Castle from 1625 proved a great back drop for the wedding meal (and a few cheeky pie photos while I was there!) what you really want to know is how did the pies rate? Would they indeed be pies fit for a king? 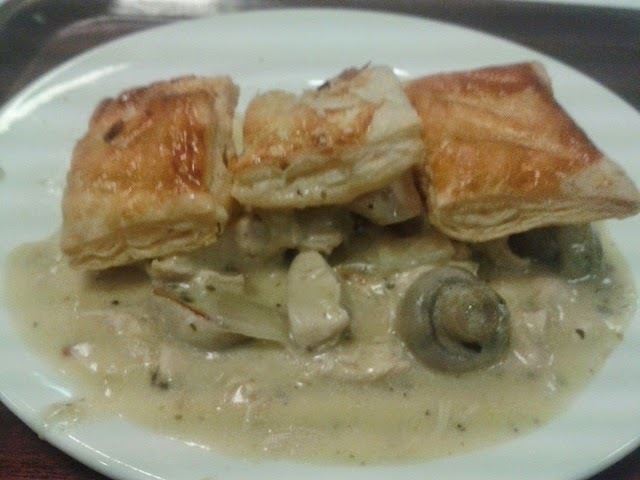 The Tasty Pie certainly lived up to its billing as a savoury pie with a filling of chicken in a creamy sauce, encased in puff pastry! At 800g this is definitely a family pie requiring sharing, unless you are a particularly hungry Pierateer, and was reasonably wide but shallow as a result. The pastry was lovely and golden, not too thick and certainly didn’t overpower the pie’s flavour. Despite being quite shallow the pie was still packed with chicken pieces. 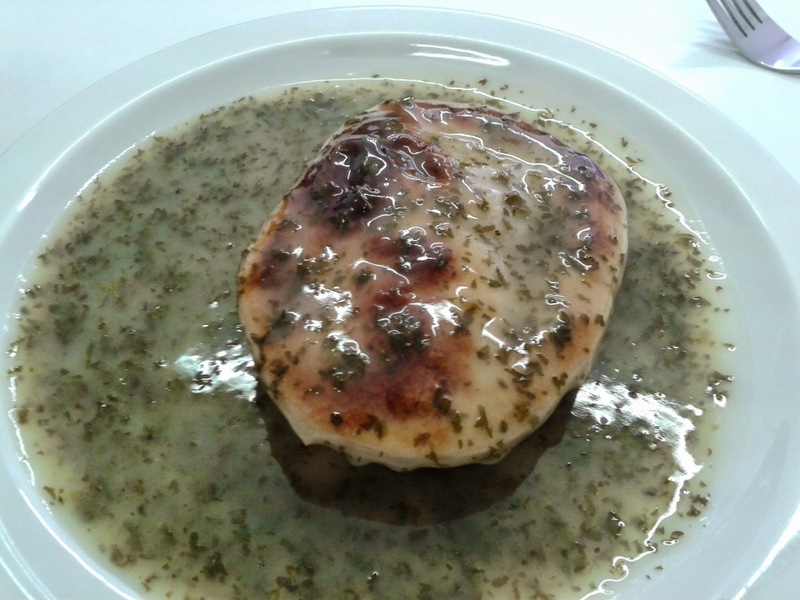 The sauce was well balanced with the meaty content, and while they could perhaps have been a little more imaginative with the flavouring, the pie was very tasty. I’d certainly happily eat another! The McColgan’s “Chef’s Special Chicken Breast and Ham Pie”, in a rich creamy sauce and wrapped in golden flaky pastry was quite a different beast in comparison, but still very nice. At 230g this was a more typical individual pie, reasonably sized for an individual portion but could have been a bit bigger. It boasts of its 100% pure Irish chicken and the mix of ham is a classic addition to a chicken pie. 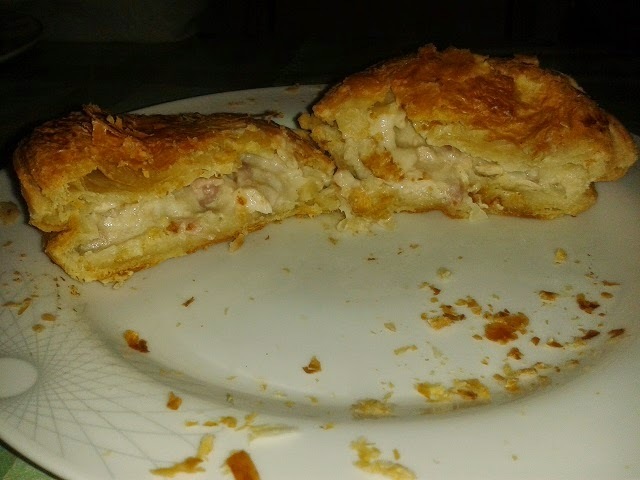 The creamy sauce was very good, a little more seasoned and with a thicker pastry. While you couldn’t deny there was a good level of meat in it, the pie did collapse a bit when cutting, as evidenced in the photo, which a pie full to capacity would not have the structural integrity to allow. As mentioned the pastry was also thicker and while still nice, it was not quite as enjoyable in comparison, with the pastry-to-filling ratio not quite as good as a result. Certainly another enjoyable pie, but when put head to head with the other Northern Irish pie it didn’t quite score as highly on the 7 Cs of pie rating. 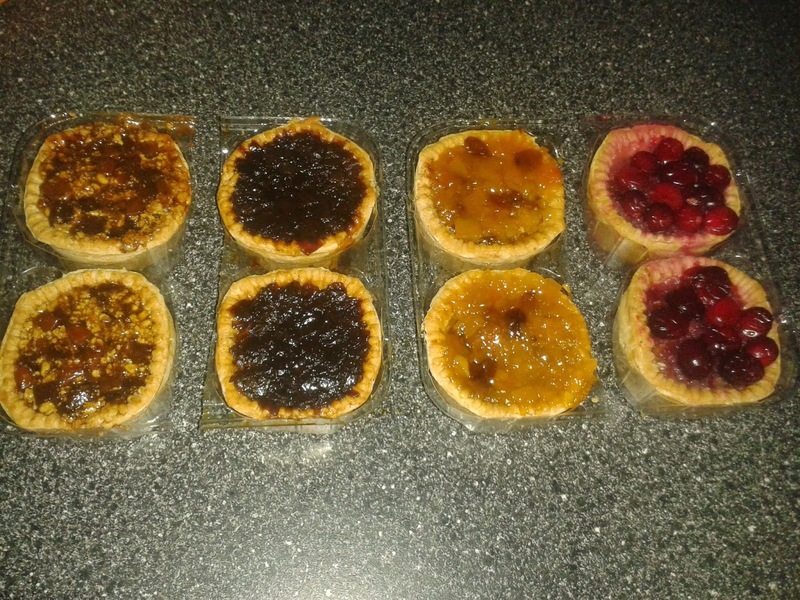 Overall it was a successful foray into pie making in Northern Ireland with two Pierate Recommended pies and good to tick off another country in the process, but these were both shop bought pies and I’d love to visit again soon to try some home-baked pies from Northern Ireland too! 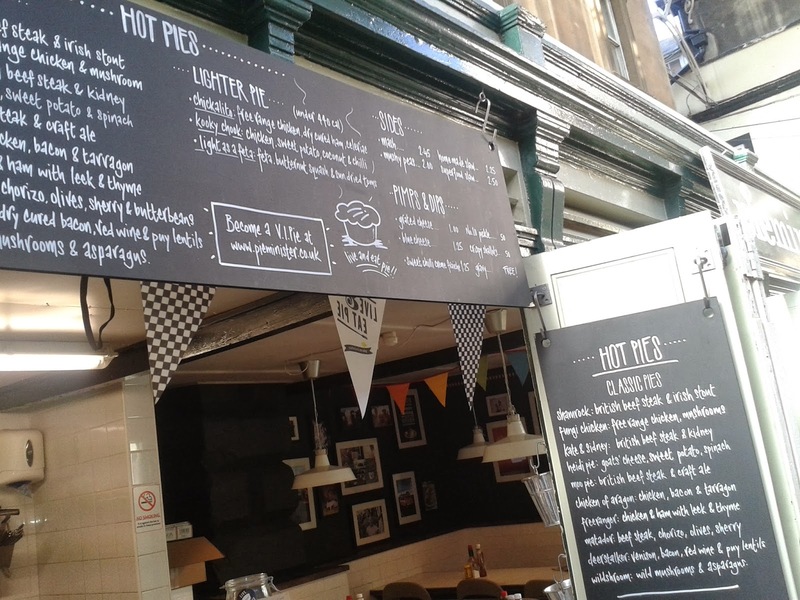 continue reading "Pierateers reach all corners of the UK with Northern Ireland pie reviews"
At Pierate we know how competitive the it is in the world of Pie. There are so many great pie companies out there so when one celebrates it’s 100th birthday then they must be onto a good thing! 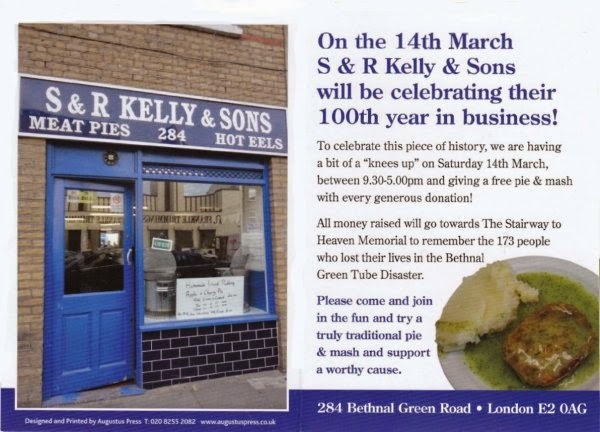 On Saturday 14th March 2015 S & R Kelly at 284 Bethnal Green Road in London celebrate 100 years of bringing little pastry packages of joy into peoples lives. It seems appropriate to add them to the pie rankings at Pierate to celebrate this special occasion. When hunting down S & R Kelly you may notice that there is also a G Kelly on the same road and it is easy to get confused. This kind of thing seems to be common in the Traditional London Pie and Mash scene, with a number of members of the Manze family running their own pie shops such as L. Manze and M. Manze. As you might imagine given the age of the shop, S & R Kelly is very traditional. This is quick and convenient food, not the gourmet pies served at newer places like Piebury Corner. This is reflected in the price with a pie alone costing £2.10 and pie and mash £3. It seems that S & R Kelly has been renovated somewhat over its 100 years, as whilst it looks old, it doesn’t seem quite as old school as the rival G Kelly but it is still quiet charming. The traditional booths are present and correct and I grabbed a pie and found myself a space. Despite it being lunch time I was a bit concerned by their lack of trade. It did soon pick up though with a flood of people through the doors at once. 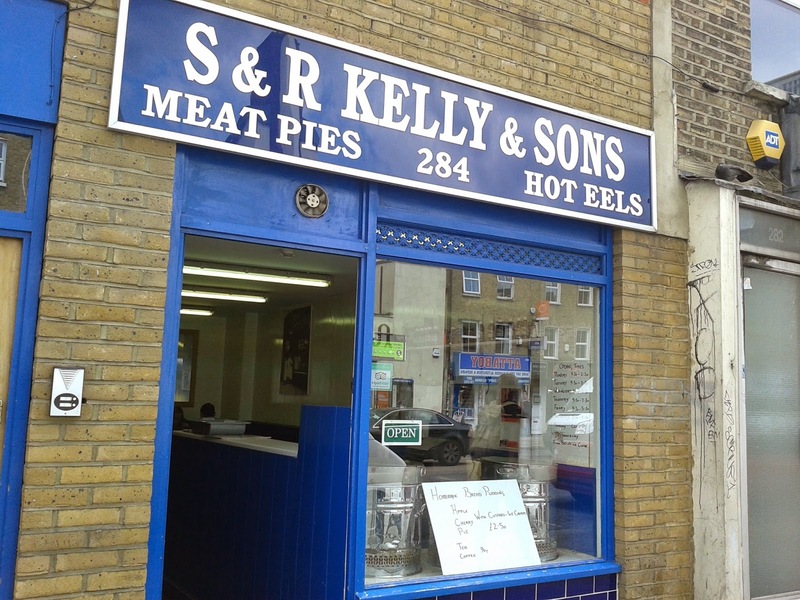 I wondered whether there is a set time that people traditionally come for their pie and mash or if it was just that G Kelly had run out of pies? Capacity – 3.7 out of 7 – Not the biggest individual pie and it wasn't completely filled. 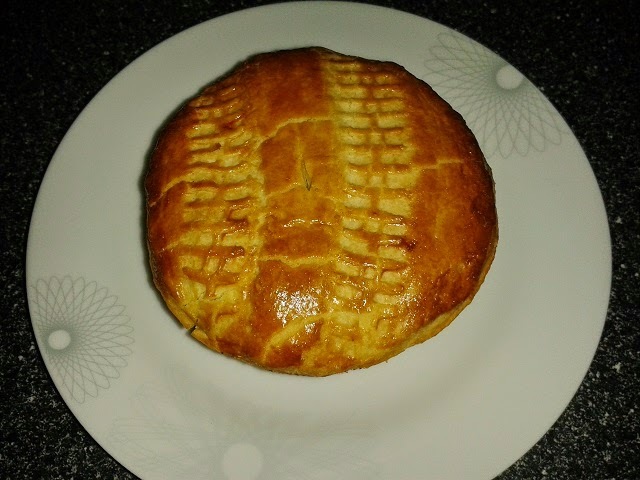 Chewiness -3.7 out of 7 – The meat wasn’t chewy but the pastry was, a bit odd. continue reading "100 Years of Pie at S & R Kelly"
As British Pie Week 2015 drew to a close, there was still plenty more op-pie-tunities for a pastry encased filling to be consumed in Southend-on-Sea, as Pierateer RAS looked to successfully complete the 50:50 pie challenge over the whole week, with at least one pie every day and at least 50% of his diet being pies, and Pierateer SJL looking to also complete his #PiePledge of at least one pie a day in British Pie Week. We also eagerly awaited news from The Ship's Cook, who was planning a special reci-pie this British Pie Week, the identity of which was being kept a closely guarded secret! This would be unveiled as a potentially first ever Four Course Dinner Pie! Whatever you've done, we hope you had a hap-pie British Pie Week! If you wish to support us - and more importantly all those who benefit from the charity Action Against Hunger - this week in our Pie Challenges, then please join us in donating to the charity via our justgiving page. Thanks so much! As mentioned in Day Six, Pierateers RAS and SJL had been on a roadtrip and were now in sunny Southend-on-Sea in Essex for Saturday's football match and a chance to experience some sunny Southend pie! 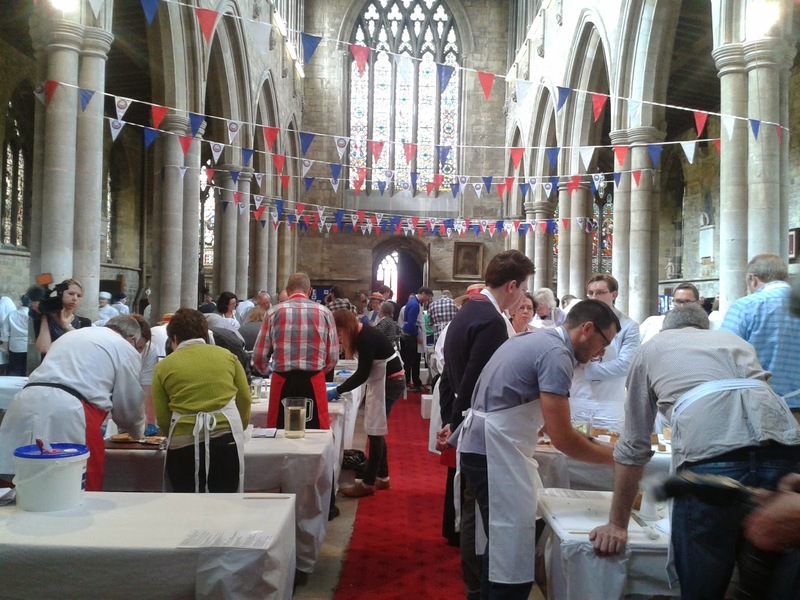 With 65 pies having been consumed between Pierateers RAS and SJL in the first six days of British Pie Week 2015, it was still anyone's guess as to how many pies they would end up with by close of play at midnight on Sunday. Both Pierateers had Mr Kipling Apple Pies to finish consuming, with Pierateer SJL having three between midnight and 10am, where as Pierateer RAS had a more modest one for breakfast. Having headed down to the seafront, it was time for a round of Adventure Golf and a stroll along the Southend seafront, before deciding upon which cafe to stop at for a seaside pie! We were pleased to see a number of options available, but eventually went for The Pier Arches Cafe, which as the name suggests is just under the pier arches of Southend Pier at the land end. What you may not realise is that Southend Pier is actually the longest pleasure pier in the world, at 1.34 miles! Both Pierateers chose the steak pie from the menu without a moments hesitation and it tasted pretty good for a homemade tray pie. We had ensured that it was a fully encased pie before purchasing, after finding out after ordering the previous night that the pies they had ordered were just top crusts! The slice of pie was served with chips and veg. A short while later - after winning a couple of packs of Pirate (sadly not Pierate) playing cards on the 2p arcade machines - Pierateer RAS had a famous Rossi's ice cream before the lads set off on the journey home. For the purposes of the 50:50 challenge, I also need to inform you that Pierateer RAS then had chicken nuggets and chips when he got home that evening to fill the hole, but this still meant another #PiePledge successfully completed, as he was left with a very impressive 67%:33% pie to non-pie ratio when it came to his British Pie Week diet. As mentioned at the top of this article, The Ship's Cook had been busy preparing for and baking a pie to enjoy as the final meal of British Pie Week. 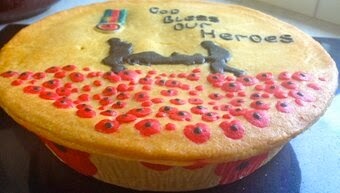 However this was no ordinary pie recipe! This was a homemade recipe and involved encasing four different meal courses into one amazing pie, completed with different filling compartments! It has to be seen to be believed, so I'd recommend going straight to the article right now to see it! 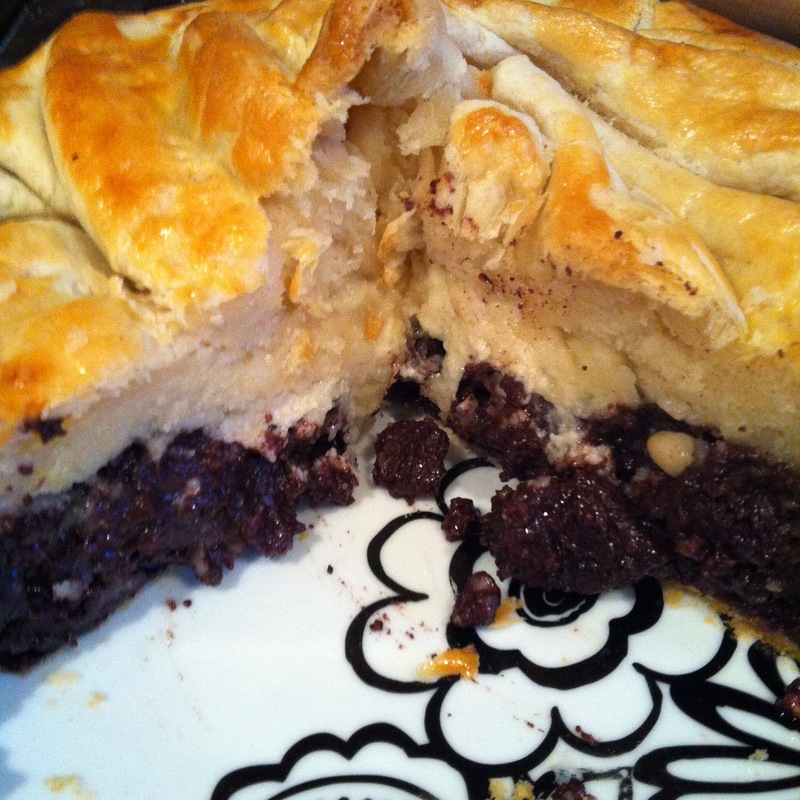 Click here for the Four Course Dinner Pie recipe review! So there we have it - 71 pies eaten by Pierateers RAS and SJL alone, with a fantastic new reci-pie by The Ship's Cook to round it all off! Of course while British Pie Week may have now officially ended, we at Pierate HQ will be busy reviewing lots of the pies we've eaten over the coming few weeks. Pierate really is the home of the pie review during British Pie Week and all year round! The only thing that remains for us to say this British Pie Week 2015 is thank you for joining us and remember - pies are for life, not just for Pie Week! 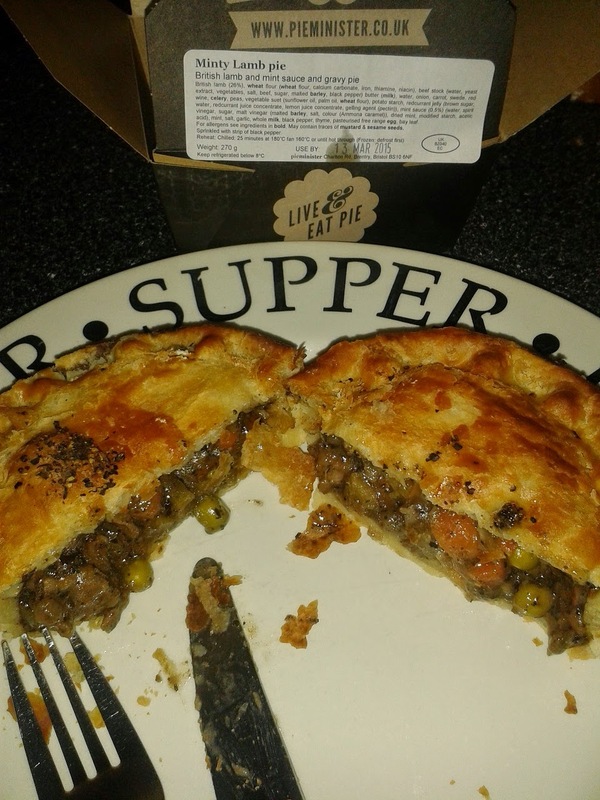 continue reading "British Pie Week 2015 - Day Seven"
British Pie Week Special - Could the Four Course Dinner Pie revolutionise pie eating?! My #PiePledge for British Pie Week was to try out a new pie recipe, so I thought I'd invent one all of my own! As British Pie Week drew to a close, I decided to celebrate in style with a four course meal. But of course this wasn't just any four course meal - this was a four course meal in a pie. Yes, you read that correctly, an entire four course meal encased in delicious pastry! I started by making the pastry case and walls, out of shortcrust pastry because I thought that would be quite sturdy. I then blind baked the case while I made the fillings. The French onion 'soup' was mostly onions slowly cooked in butter with salt, pepper and some flour, and then I made a very thick beef gravy with Worcestershire sauce to make it more like soup. The pork course was pork mince, onions, mushrooms, apple, salt, pepper and some dried herbs. The pudding (apple and raisin) was Bramley apples, raisins, ginger, cinnamon, mixed spice and brown sugar. Finally, the brie and cranberry was just that - layers of brie with cranberry sauce. I topped the whole thing off with a puff pastry lid, marked it with a series of holes to indicate courses 1- 4 and popped it in the oven until it was brown and crispy. I'm not sure whether it's fair of me to rate my own pie, but I'm going to give it a go anyway - I'm afraid I am a bit biased and I think it was brilliant! Mixed success here but mostly good. The onion soup section was lovely and moist, with soft onion and smooth gravy. The pork mince was a bit dry and needed some sauce. The apple and cheese layers were both moist without being too runny. I packed this pie pretty tightly with filling, but it still felt like I was eating a lot of pastry. Still, if you're going to eat four courses of pie you probably love pastry, and I certainly didn't mind! 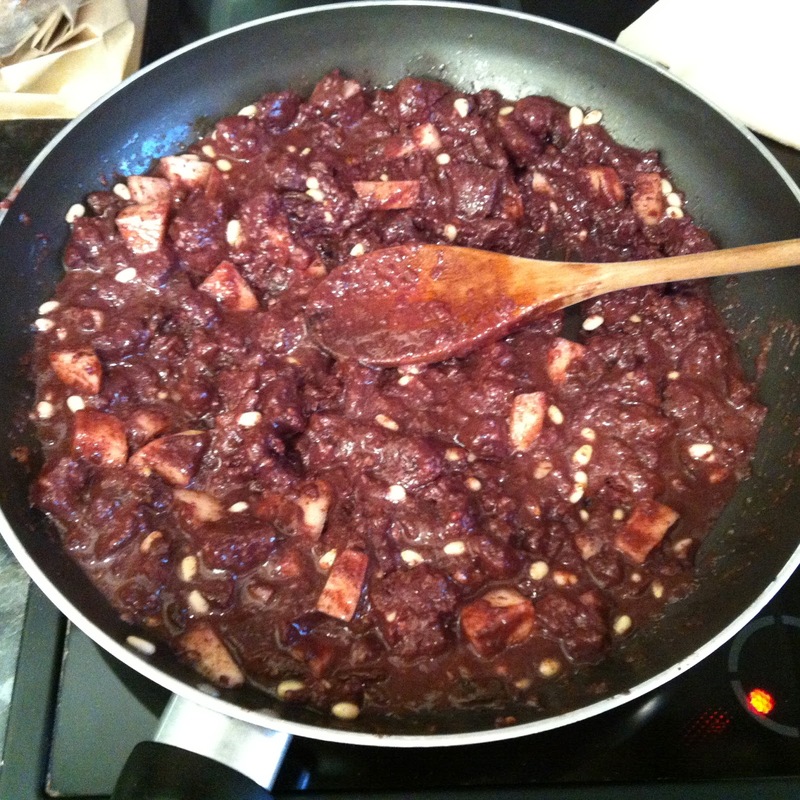 No unpleasant chewiness here - I think I got it right with the mix of ingredients. The fairly large pieces of onion in the soup course meant it wasn't too runny, and the addition of mushrooms to the pork and raisins to the apple added a nice texture. The cheese was soft and gooey, which is exactly how melted cheese should be. I'm giving myself (and my friends who helped with the recipe) full marks here. It was a FOUR COURSE MEAL in a pie, and it was absolutely delicious. This isn't the cheapest pie ever because you have to buy quite a lot of different ingredients, but I did end up with loads of leftover fillings that didn't fit into the pie. So those are in the freezer ready for another meal, and I think the cost was worth it for the impact this pie makes. I was really impressed with this pie. I thought it was going to collapse and end up being an onion-pork-apple-and-cheese pie but amazingly the walls stayed solid and the courses stayed separate. I even managed to get a slice of each course onto a plate so you can see them properly! Overall, my #PiePledge was a definite success. I strongly recommend that you all go and make your own four course meal pies. Try out different ingredients and let us know what you think! Be prepared to be very full though - I know I am! continue reading "British Pie Week Reci-pie: The Four Course Dinner Pie"
So after the end of the #Pieathon challenge on Day Four of British Pie Week - where both Pierateers SJL and RAS were seeing how long they could last eating only pie - there was still no let up on the pie front! Pierateer RAS was still attempting the 50:50 pie challenge over the whole week, with at least one pie every day and at least 50% of his diet being pies. And going into Day Six they had a special trip to Southend-on-Sea to factor into their pie eating plans! Whatever you do, go crazy for pie this British Pie Week! Enjoy! Day Six saw Pierateers RAS and SJL going on a roadtrip down to sunny Southend-on-Sea in Essex for a football match and a chance to experience some sunny Southend pie! Having had his first proper chocolate craving of the week, Pierateer RAS went for the unusual choice of a chocolate bar for breakfast but was saving up his ap-pie-tite for the BIG MATCH! Southend United were hosting Wycombe Wanderers in a top-of-League-Two clash, and while we had already reviewed the Pukka Pies Curry Pie from Southend's Roots Hall in 2014, we still tucked into the pies there again this year. Find out where the Southend United pie rated in our Pieremiership - Football Pie League. Pierateer RAS went for a Pukka Pies Beef and Onion Pie, while Pierateer SJL went for the same Pukka Pies Chicken Balti pie he had reviewed at Roots Hall last year. Pierateer RAS did have chips with his pie - noted for the 50:50 pie diet challenge. The evening meal gave us an op-pie-tunity for Pierateers RAS and SJL to try The Pipe of Port - a wine bar that specialises in pies on its food menu - which they had been recommended by residents of Southend via our Suggest-A-Pie feature. While there we found out that there is an interesting relationship between The Pipe of Port and Fuud Ltd, a local company that make pies. The recipes are made held by The Pipe of Port but made in the pie factory operated by Fuud Ltd - an interesting combination we had not encountered before. However while Fuud Ltd make the fillings and do at times sell the pies fully encased (for example, we rated some Fuud pies last year), the pies are served in ceramic dishes as top-crusts in The Pipe of Port. This was a shame as we prefer fully encased in pastry pies, particularly having enjoyed the fully encased Fuud Ltd pies last year, but we will review them soon. Pierateer RAS and SJL shared the pies, having half a Game Pie and half a Lamb, Rosemary and Garlic Pie each. Pierateer RAS had jacket potato with his halves of pie, meaning for the first time this week he ate more non-pies than pies that day. There's only one day left now of British Pie Week 2015 - but fear not! We will be reviewing lots of the pies we've eaten over the coming few weeks. Pierate - the home of the pie review during British Pie Week and all year round! 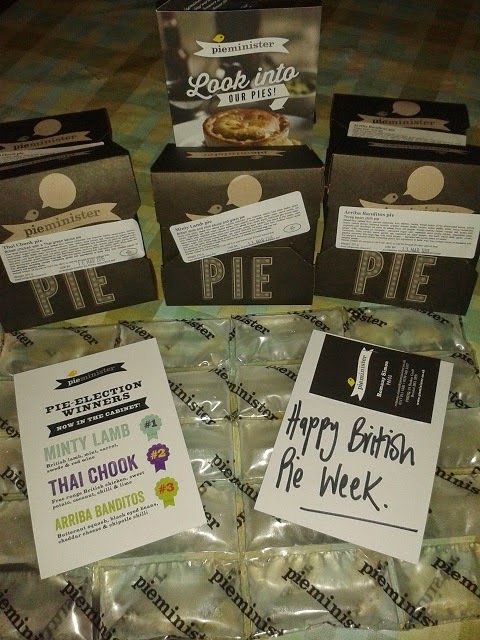 continue reading "British Pie Week 2015 - Day Six"
This British Pie Week we got a huge delivery of pies from Toppings Pies - over 6kg worth of pie (and some stray quiches and pasties!) - and included in them where a new range of Dinky Topped Pork Pies that are proving to be popular. So popular in fact that they are being launched in Selfridges, Manchester this morning! So what's in the range and how do they rate? The Dinky Pork Pie range includes Cranberry, Pickle and Wensleydale Cheese, Stilton, Caramelised Red Onion and Normandy Chutney. I think it's important to note that this range of pies is quite a niche product, as it contains a number of toppings in place of the lid of a traditional pork pie that would cause mixed reactions in the kitchen. I certainly noticed that, with certain pies in the range being a lot more popular than others due to the nature of the topping. The Caramelised Red Onion proved the most popular from the selection below, while the Cranberry topped pork pie was considered a bit too sweet by many. I guess it really is horses for courses when you start providing alternative toppings to your pies. We on the Pierate Ship do consider only a fully encased pie to be a proper pie, however we do understand in reality more and more places are offering other forms of pie, either bottom-less in the case of a top-crust or lid-less in the case of these Dinky Pork Pies. Due to the niche flavours used, not all of which are to my personal liking I must admit, I have rated the Stilton Topped Pork Pie and would then advise you to select the topping you personally prefer when purchasing, which can be done online as well as in some shops, at a very reasonable RRP of £1.50 for a 120g pork pie. The pastry was quite crisp, holding together well when cut into pieces. It was the classic hot water pastry crust done well. The pies were quite small but packed a punch with their original toppings. While I (and a few other people I shared them with) felt there could have been a little more pork to counter the strong flavours of the toppings, the quality of the pork meat was obvious and the toppings certainly added flavour to the pie. The capacity was very strong, with minimal jelly and a quality tasting meat content. While they lose some marks for not being fully encased they still score well. 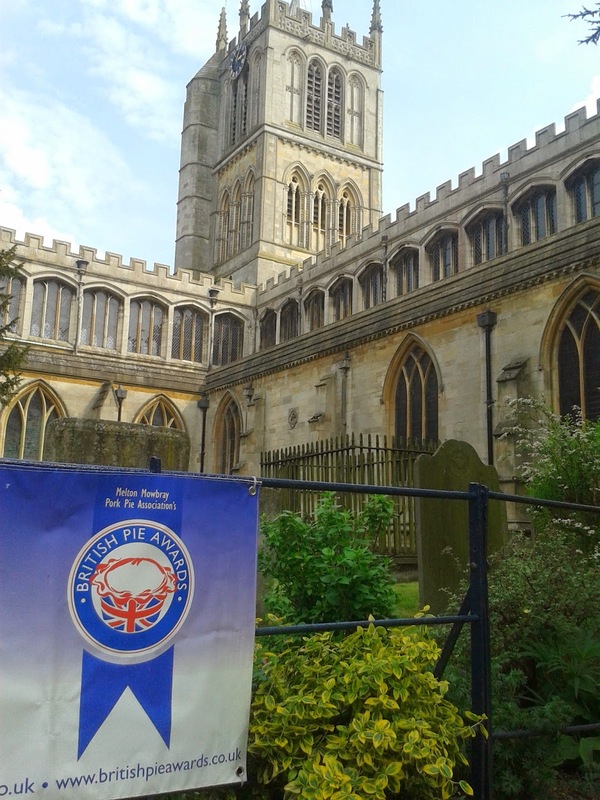 continue reading "Topping off British Pie Week with a pork pie?" So after the end of the #Pieathon challenge on Day Four of British Pie Week - where both Pierateers SJL and RAS were seeing how long they could last eating only pie - there was still no let up on the pie front! Pierateer RAS was still attempting the 50:50 pie challenge over the whole week, with at least one pie every day and at least 50% of his diet being pies. And going into Day Five they had already broken the 50 pies barrier, so how many more pies could they consume still?! This page will be updated with the pies we Pierateers eat and any other pie news throughout the day. Check back each day for daily updates this British Pie Week! With the day off on Friday, Pierateer RAS took the chance to have a lie in before digging into a few more Toppings Pies for brunch. With such a big box of Toppings pies delivered on Wednesday, he took it upon himself to get through the three non-pork pies that Toppings had provided. The three meat pies on the menu were 1) Peppered Chicken and Smoked Ham 2) Steak, Mushroom and Shallot Pie and 3) Steak and Minted Mushy Peas. 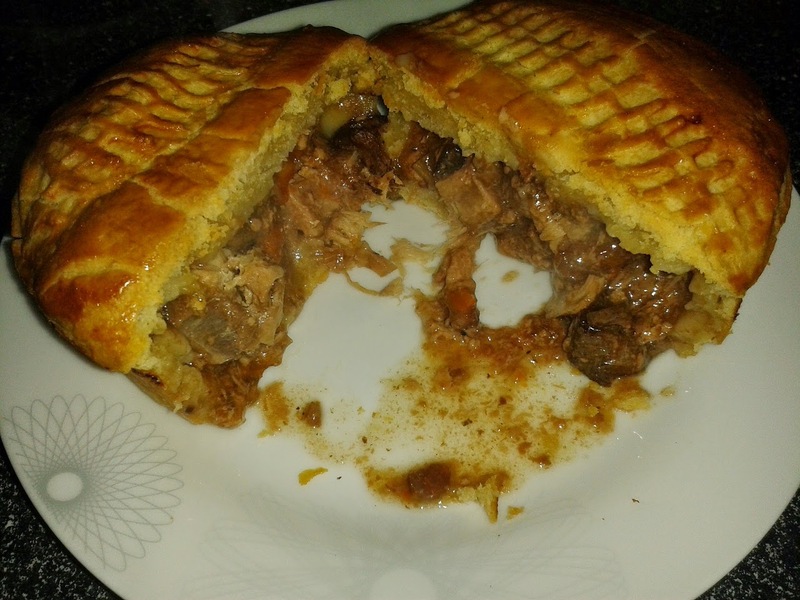 They all had delicious pastry encasing and the meat inside was generally very good, however he was left disappointed at the lack of meat and over emphasis of shallot in the Steak, Mushroom and Shallot Pie. The extra time also gave Pierateer RAS the chance to rate the winner of the recent Pieminister Pie Election he'd had for supper the previous evening! The "Minty Lamb" was the pie you chose from a selection of their previous pies (no longer on sale) to be brought back for the week and it rated very well indeed! 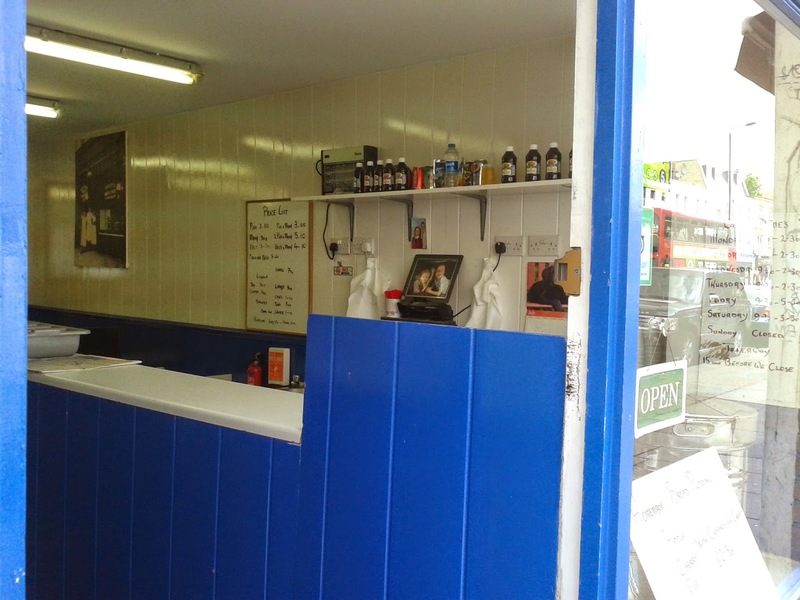 The Minty Lamb pie review can be seen here, and reviews of their other two winning pies will appear soon! These are available in many Pieminister-selling pubs and restaurants and market stalls for British Pie Week only, so get on down and reminisce about the good old times with these pies! We'll be rating all three this week to add to our Pieminister Pie Reviews page! A dinner of fish, chips and veg for dinner rounded off another pie-focused day and kept his Pies to Non-Pies ratio well in favour of the pie! Having eaten 36 pies in the first three days, Pierateer SJL took Day Five as a bit of a 'fallow' day. 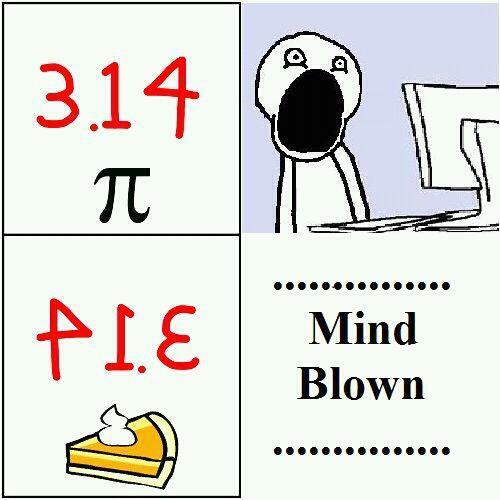 The only pie consumed was just before bed. It was a Treflach farm Steak & Kidney pie picked up from Allens of Mayfair the day before. 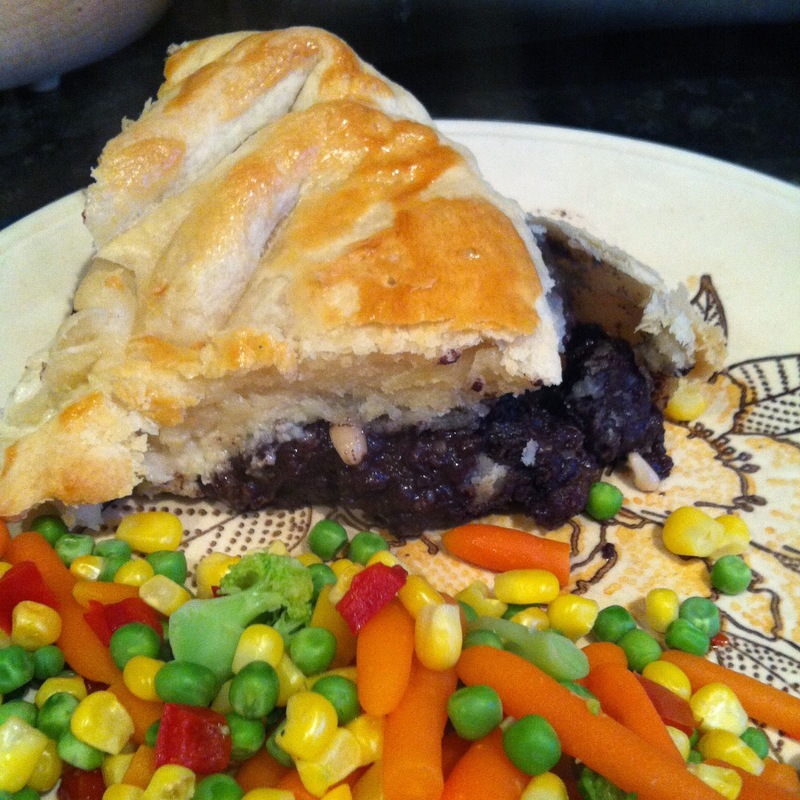 Whilst it didn't look great, a bit lop-sided and with a bit of boil out, this pie tasted nice. The pastry was nice and soft with a little crispiness on the outside. The filling was packed with soft meat which tasted nice, but it was a little dry and tasted a bit like well done roast beef. Having rated the pie in the Barclaycard Arena earlier in the day, Pierateer Rob was delighted to once again feature in the Yonex All England Badminton Championships Volunteers Newsletter with a review of the Chicken and Mushroom pie he had rated! It was the third time in a row he had the opportunity to do so. We also loved the tweet we got from Nice Pie featuring a cartoon in their local newspaper. It focused on the exotic nature of some of their pies, particularly following their appearance on TV on Jamie and Jimmy's Friday Night Feast recently, where their squirrel pie was featured! It was also great to be featured on the Bakery Info website in their article about British Pie Week. continue reading "British Pie Week 2015 - Day Five"
continue reading "Pieminister Pie Election - Minty Lamb Review"
Some of you may remember that last British Pie Week Pierateer RAS was at the National Indoor Arena (NIA) in Birmingham to help with the Yonex All England Badminton Championships 2014, but also got a chance to rate the NIA Chicken and Leek Pie. 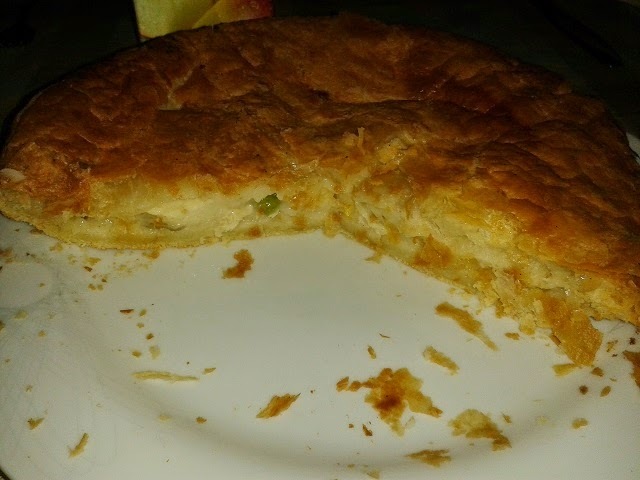 While back in 2013, an NIA Apple Pie was on the menu and got rated on the 7 Cs of pie rating. And with scores of 4.43/7 and 4.2/7 respectively, they both got a decent score but there were a few service faults and certainly room for improvement. Back again this year at the badminton - though since last year the NIA has been rebranded the "Barclaycard Arena" - I was please to once again see they had pie on the menu and we have rated the Chicken and Mushroom pie. 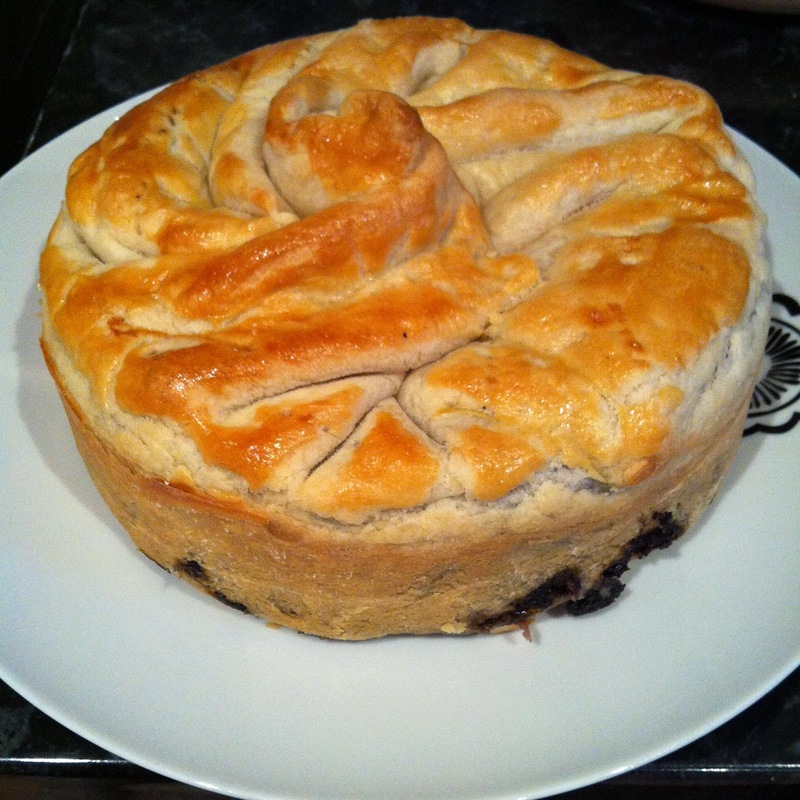 As you can see from the photo, this is just a top crust pie, made from individual "puff pastry parcels". At www.pierate.co.uk we are quite pie purists, so we would prefer to see a pie fully encased in pastry and a puff pastry parcel lid will lower the score in condition and capacity, however it was good to see the top pastry was quite golden. This top pastry layer was quite tasty and crisp, though there were definite murmurings of a lack of pastry encasement by fellow pie eaters. Without a pie casing, the filling just spilled all over the plate and so the condition wasn’t great and the consistency was rather runny. The filling spread all over the plate and it was great to have a decent amount of chicken, which was tender and quite flavoursome in the sauce provided. However it is very difficult to judge the capacity with such a lack of pastry structure to support the pie. There was a bit of mushroom in it to bulk out the pie filling, which was quite firm, but it was certainly mainly chicken. At £7.50 for the pie meal, this isn’t really a price I’d be making a racquet over. While the Barclaycard Arena canteen staff have once again done well to show their support to British pie for all the international guests at the badminton in British Pie Week (as they did in 2011, 2013 and 2014), I would like to have seen them encase the pie in pastry. However, all in all, it was quite a nice top-crust pie meal without challenging for the top seeding. 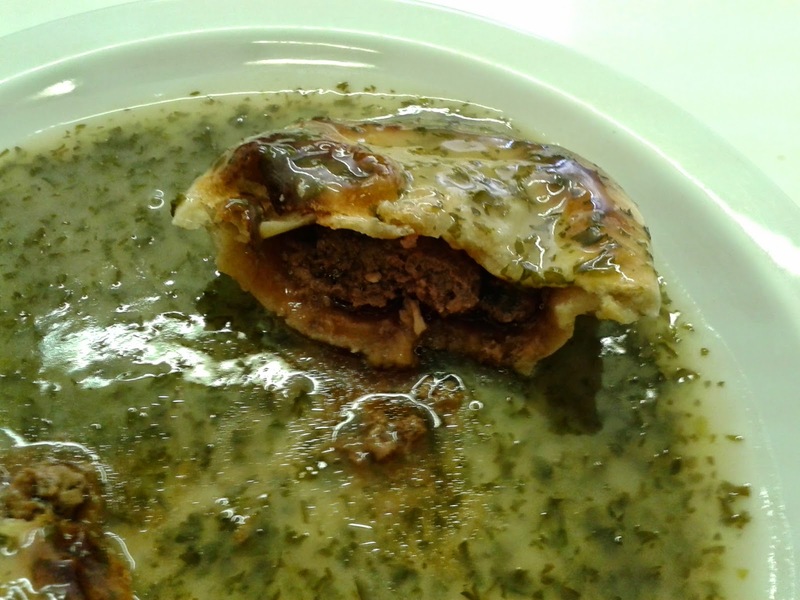 continue reading "A smashing pie at the Badminton in 2015?"